Furnace: Needs New Water Heater: Needs New Water Lines: Seems O.K. Drain Lines: Seems O.K. Gas Lines: Seems O.K. 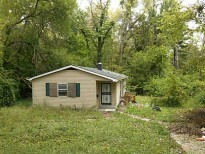 Nice three bedroom in a wooded area on Indy's North side. Home is tucked back on a private lot with mature trees. This property is great for growing family.